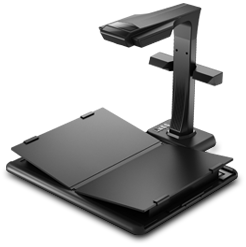 The CZUR ET16 Plus ($429) is an atypical scanner, lacking a flatbed and a document feeder. With its scan unit residing on a beam extending well above the scanning area, it looks rather like a desktop lamp. 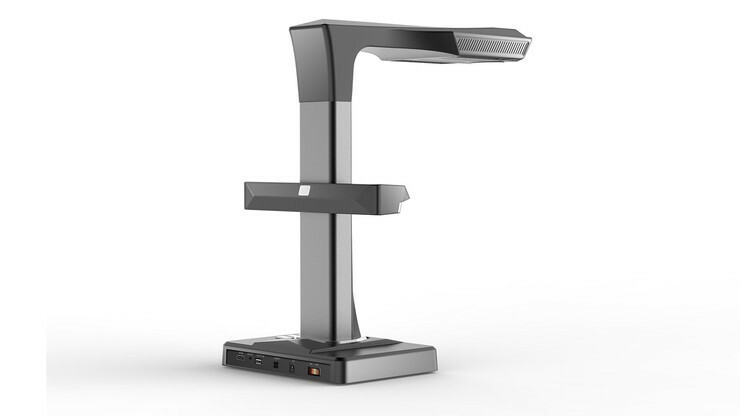 It is an overhead scanner, and of the models we've tested, it most resembles the Fujitsu ScanSnap SV600. As such, it is versatile, able to scan documents, books, and some 3D objects. In my testing it didn't come close to the book-scanning speed the company claims, but it is faster than other book scanners we've reviewed. Its blend of speed, features, and versatility earns it our Editors' Choice. Book scanners come in several forms. There are flatbed book scanners such as the Plustek OpticBook A300, with a platen that extends to the very edge of the scanner so that one can place a page flat, with the facing page and the rest of the book hanging over the scanner's edge. Then there are V-shaped book scanners, generally made for the professional market—libraries, archives, and the like—in which you place a book face-up in a V-shaped fold, and it's photographed with a digital SLR camera. A prime example is the Atiz BookDrive Mini, though it is relatively expensive at more than $6,000, and that's before you buy the camera. Overhead scanners such as the ET16 are both relatively fast and reasonably priced. 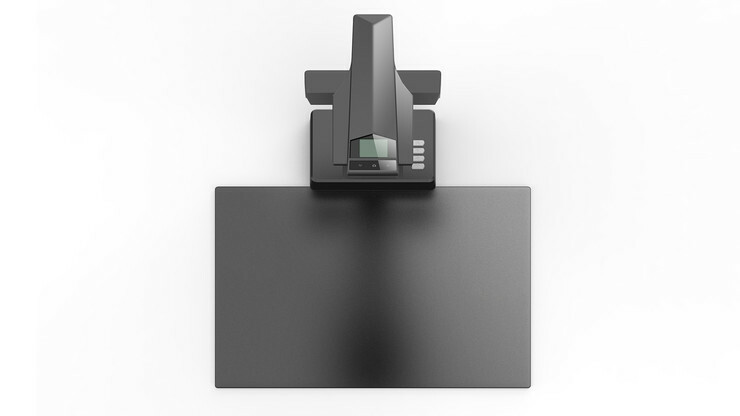 The ET16 Plus is a matte-black scanner. The main part of the unit consists of a base from which sprouts a vertical pillar, which ends at an arm that contains lights and the scan unit (a 16MP CMOS sensor). It measures 15.4 by 8.7 by 14.8 inches (HWD) and weighs 3.3 pounds. 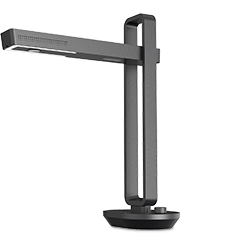 The successor to the CZUR ET16, the ET16 Plus adds side lighting, with additional lights at either end of a beam that can be placed about halfway up on the pillar that holds the scan unit itself. On top is a tiny display, which shows you an image of the object being scanned. At the base are four silver-colored buttons, which can be used to launch scans and adjust the lighting. An included black mat, which acts as the scan bed, fits at the scanner's base. Usable scan area is about 11.5 by 16.5 inches, and standard resolution is 250 dpi. In back of the base are the power switch, as well as the ports. Connectivity to a computer is handled via USB 2.0 with an included cable. Also included are a scan button and foot pedal, either of which can be connected to a second USB port in back of the scanner. The ET16 Plus also comes with two "finger cots," which you can place on a finger or thumb to help flatten a book and hold the pages in place. The finger cots have a pattern printed on them that renders them invisible in the scanned pages. To assemble the ET16 Plus, you attach the side lighting to the pillar, and position the mat beneath the unit. Then you'll need to install the software from an included disc, and attach the scanner to your computer via an included USB cable. (The software on the disc is Windows-only, but Mac drivers are available for download from the CZUR website.) 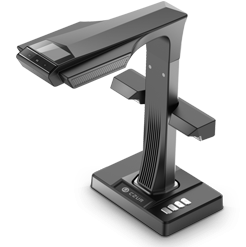 When you start the software, the first screen that comes up gives you two choices: Scanner and Visual Presenter—the latter choice lets you project an image of the scan area using a projector attached to one of the ET16 Plus's USB ports. When you click on the Scanner option, you are taken to the main scanner interface. In the screen's upper left corner are more choices: Scan, Export, and Batch. Clicking on Scan takes you to a screen that displays a view of the scan bed and whatever document or other material it may contain. On the right side are radio-button menus that let you select between choices for color mode (Color, Patterns, Stamps, Grayscale, and B&W) and processing method (Flat Single Page, Facing Pages, Manual Selection, or No Processing). Beneath them is a toggle slider that lets you enable or disable Auto Scan, and below that is a button to launch scans. On the left side of the screen is a vertical carousel, showing thumbnails of scanned pages (if any), along with counters for the number of pages scanned and processed. There are up and down arrows that let you advance forward or backward a thumbnail at a time or go to the end or beginning of the scanned pages. Fortunately the icons readily identify their functions, because when you hover over one, a description pops up—in Chinese. Other than that, there are no linguistic issues of note—the usual manual and help page are in reasonably good English. The Export tab lets you select pages, with their filenames (with checkboxes next to them) listed down the right-hand edge of the screen. There are also checkboxes that let you check all pages, or just the left pages or the right pages of two-page spreads. Once you have chosen the pages you want to export (all pages are initially saved as JPEGs), you can select a format: OCR, PDF, Searchable PDF, or TIFF. The software will then convert the pages into the format you've chosen and combine them into one file. It will also open File Explorer, where you can name and save the new file. With the Batch tab, you can perform various operations on a group of scanned pages, including adjusting color mode, rotating, cropping, deleting, renaming, and printing. CZUR's software is a self-contained program and overall is reasonably well designed, though there is a learning curve, and you will have to refer to the user manual to see how to perform various functions. 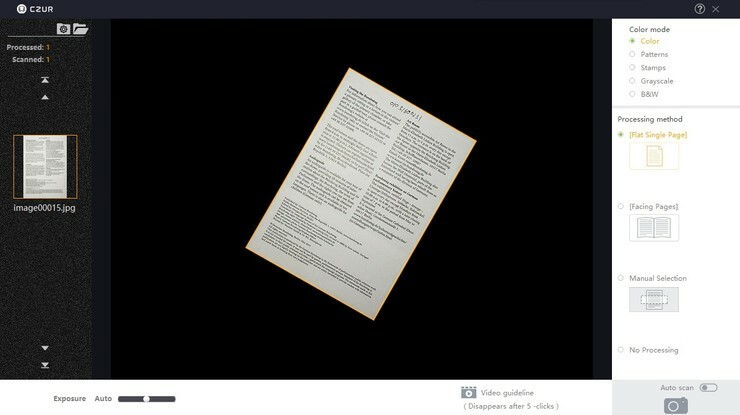 According to CZUR, the ET16 Plus can scan either a single page or a two-page spread in about 1.5 seconds—40 spreads or 80 pages per minute for books and magazines—saving each page as a JPG file. (For two-page spreads, the software will separate the pages.) You can then put the pages through an additional OCR step and save them as a Word or searchable PDF file. Using the scanning program that came with the ET16 Plus, I scanned a variety of documents, including text pages, books (some containing color art), magazines, and solid objects. It did reasonably well in scanning color art pages to JPG, which I then combined and converted into PDF. Colors were vivid, although the true hue was not always reproduced. Solid objects were a mixed bag; you want to stick to non-reflective objects, or the scanner's lights could produce unwanted glare spots. (Similarly, you don't want to use the ET16 Plus in a brightly lit area, and you want to avoid placing any distinct light sources above it.) Also, solid objects should be less than an inch tall. Note that the scans you get of these objects are standard two-dimensional JPEGs and not 3D object files for 3D printing or animation. For speed testing, I scanned a 32-page black-and-white newsletter, consisting of 16 two-page spreads. I did some testing using Auto Scan—which automatically scans a spread when the software detects that the pages are in position, and then scans again whenever you've flipped the page and positioned the new spread. I also used the foot pedal to scan; I'd position a spread to my liking, and then press the pedal, and it would scan. As they are generated, thumbnails of the scanned pages appear in the left margin. A spread will initially show as one large page, and then as two separate thumbnails as the software processes each page. Once the scan is complete and all the images have been processed, you can convert the scanned JPEG images to other formats. Whichever method I used, the trickiest thing was timing it so that I didn't turn the page before the scan was completed. In the PDF files for two of our test scans that I did using Auto Scan, I noticed that pages were missing—perhaps it was a spread that I had turned before the scan was complete, or a spread that the software was not properly able to align. Whether scanned automatically or triggered page by page, a scan will only be as good as one's ability to smoothly turn the pages. (They don't have to be exactly aligned, thanks to the CZUR software's corrective abilities I did about a dozen scans of the newsletter, most using the foot pedal to scan spreads, and I got somewhat more efficient as I got more experience scanning. In my official time test, after this training period, the ET16 Plus scanned and saved our 16-spread, 32 page document to JPEG format in 4 minutes, 39 seconds. This comes to 7 pages per minute (ppm), or 8.6 seconds per page, with an average time for setting up and scanning each page of 7.5 seconds, a far cry from the 1.5 seconds per page cited by CZUR but faster than the similarly designed Fujitsu SV600, which took 2 minutes, 45 seconds to scan and save five two-sided pages. It's much faster than the Plustek A300$1,757.83 at Amazon, which averaged 12.2 seconds per page (including prescan time). For OCR, I scanned our standard seven-page test document—each page showing a font at sizes ranging from 4 points to 20 points—first into individual JPG files and then exported them to a Word file, all from within the ET16 Plus's software. Its performance was solid if unimpressive. It scanned our Times New Roman test page at sizes down to 10 points, and our Arial test page at sizes down to 6 points, without error. It did reasonably well on two standard but less common fonts, and poorly on the three exotic fonts in our suite. CZUR was founded in 2013 in Shenzhen, China, and raised a lot of money on Indiegogo to fund the product's predecessor, the CZUR ET16. 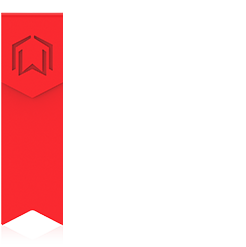 The company sells to the United States market through Amazon, and its products generally receive very good reviews on the site. CZUR's own site offers help resources and a downloadable user guide. The name CZUR is an acronym for "continue zeal until real." With the ET16 Plus, CZUR has succeeded at that. The CZUR ET16 Plus can scan a variety of material, but is probably best as a book scanner. Selling for considerably less than the similarly designed Fujitsu SV600, it proved faster in our testing. It's also a lot quicker than flatbed book scanners, in which you have to lift the cover and reposition the book before scanning each page. Although there's some learning curve to CZUR's software, it did a decent job straightening out crooked pages and other defects before saving them as scans. If you're in the market for a book scanner, it earns our top recommendation.